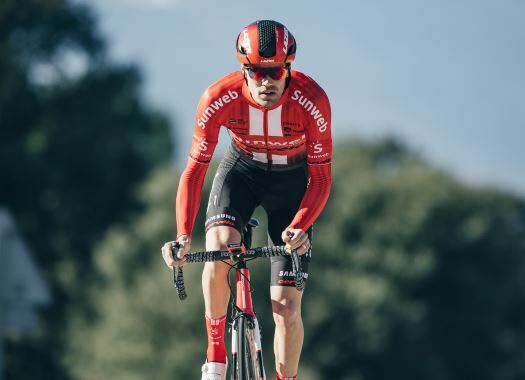 Team Sunweb's Tom Dumoulin considers that the best replacement for Wilco Kelderman in the Giro d'Italia roster is Sam Oomen. Dumoulin has suffered the loss of two supporting riders for his ambitions of winning the Italian grand tour once again. Kelderman suffered a heavy crash at the Volta a Catalunya that left him with a broken collarbone and a neck vertebrae fracture. In addition to that, it was announced that Martijn Tusveld, who broke his jaw in Paris-Nice, won't be ready on time for the Giro d'Italia, which leaves Dumoulin without certainty for the race. "Of course, that also has consequences for me," said the rider to Dutch broadcaster NOS from his training camp in Tenerife. "There is nothing to do. It is part of cycling that not everything goes as you hope and plan. I visited Wilco last week and he is walking around with a neck brace, really sad to see. He really can't do anything. Martijn has been eating through a straw for weeks. That doesn't make you happy either." Dumoulin now considers that the best helper he could take to the Giro d'Italia is Sam Oomen, who won the Youth Classification in Tirreno-Adriatico and finished in the ninth position of the overall standing. The problem is that the young Dutch talent's calendar skipped the Italian grand tour and was set for him to ride the Tour de France for the first time in his career. "I don't think a definitive decision has been made yet," explained the winner of the 2017 Giro d'Italia. "We have to see if we can turn that around or not. That is ultimately not up to me."